Where teeth are missing, our jawbone recedes. As a result, over time dentures will grow loose and need adjusting. Denture implants stay in place. They will never embarrass you by falling out or cause painful gum abscesses. You can find out more about having denture implants by talking to our Treatment Coordinator. Book a free consultation today. Denture implants are like standard dental implants – only smaller, which is why they’re also known as mini-implants. We use a gentle, non-surgical procedure to fit them. Most denture implant treatment takes just one visit. Mini-implants can permanently stabilise dentures. They can also anchor a cemented crown or tooth bridge. The cost of mini-implants varies depending on the number you need. 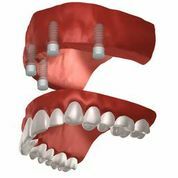 Permanent dentures usually need 4 mini-implants to secure them in place. See our dental implant prices. Laugh, speak and eat with confidence again. Permanent dentures stay in place. So more sore spots or slipping around. With less denture base covering the roof of your mouth, you’ll find it easier to form words. And, you can enjoy the full flavour of your favourite foods. You’ll be able to bite and chew almost as if you had your own teeth back. Eating will become a pleasure again and you’ll digest your food better. It will take about an hour to fit your mini-dental implants. The procedure is very simple, and you’ll be able to go home with your new teeth the same day. If you are in a hurry to have dental implants, or if you’ll find more lengthy treatment difficult, same day implants could be the answer. This technique means you could walk away with a beautiful, natural-looking smile after just 1 appointment. Same Day Teeth is possible for both upper and lower teeth. A permanent tooth bridge is attached to tilting implants giving you fully functioning teeth straight away. The implants don’t affect the sinus and nerves. And, patients with bone loss won’t need a bone graft.